In preparing for my last cross country flight I took advantage of some newer tools. I started my planning with the new online version of the AOPA Flight Planner powered by Jeppesen. I have used the software based version of the flight planner in the past and enjoyed checking out their web-based version. It was fairly intuitive and only took me a few minutes to build my desired route. I was able to add GPS waypoints and airports simply by clicking on the appropriate icons on the online chart. I also wished to add one custom waypoint for the Arlington Park racetrack which was easy enough to do with a right-click. After you select your route if you have aircraft entered into the system it will generate a navlog with the appropriate speeds. As you get closer to flight time you can run weather reports for the route of flight and then the AOPA flightplanner updates your navlog with the appropriate speeds and headings accounting for the winds. If you plan on filing a flightplan you can do that too from the system. All routes your create can then be saved for future reference. If you are an AOPA member I highly recommend you check it out. For this flight I brought along my traditional sectionals but left them in the backseat. 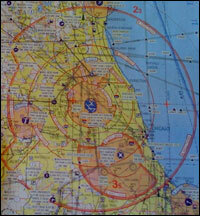 Instead the Jeppesen VFR+GPS Great Lakes (GL-3) Chart sat in my lap for most the flight. I first learned about these maps while at AirVenture this summer. Most of my flying takes place in northern Illinois and throughout Wisconsin which would require a few sectionals. With this chart I could fly from Champaign, IL to Cherryland Airport in Door County, WI with a single chart. These new charts have ditched the greenish color we all are familiar with from our sectionals and instead is white allowing colors used for airspace, airways and airports to pop more. I feel they have made these charts easier to read. One major improvement was the very clear markings of ceilings and floors of airspace. These charts took into account that so many pilots are using GPS in flight and are designed with that type of flight in mind. Many pilot shops are starting to stock them but if you can't find them at your local shop you can purchase one directly from Jeppesen. I now keep one in my flightbag for all flights. I've been using that exact combination of software and charts for my training for awhile now and I'm pretty happy with it. I'd love the AOPA tool to be a bit faster, but it is easy to use. And the new Jeppesen charts are terrific. Much easier to read than the standard sectional or terminal area charts. I agree the AOPA tool could be faster. Glad to hear you too are enjoying the VFR+GPS Chats! What part of AIFP do you find slow? Map redraws? Something else? Next time you're in the flight planner, click into the video tips (the light bulb icon in the upper right corner) and submit feedback to us. We're here to make the flight planner better. Just keep the comments coming. Thanks for comment. Don't get me wrong the AOPA Online Flight Planner is a great tool and is a great improvement on the desktop software. My only point is that we are all accustomed to tools like Google Maps and AJAX programming that allows a user to make some changes without reloads. A) As a VFR pilot I often look at the details so I zoom in. To than pan across my route requires reloads it would be great if the neighboring areas loaded in the background then when I panned it would not require a load (similar to Google Maps). B) Sometimes I want to toggle on more than one map overlay at a time. If I do that now I have to do a repetitive step of selecting the overlay then re-selecting the navigation tab to open the selections again and select another overlay. Maybe allowing you to select multiple overlays to toggle on or off then hitting save or implement to update the map once would be nice. C) Lastly if I want to add a user defined waypoint to my route I have to first add the point then add it to my route. A tool like SkyVector will allow you to right click a spot and "Add a GPS Lat/Long" to your route in one step which is a nice quick feature. As I said above just minor feedback to make the service even better but it is still a great tool that I use in planning each of my flights. I did some work with AOPA evaluating the usability of version one of AIFP and I can assure you that B & C above are in the plnas for an upcoming release. In fact it is waiting some enhencements that will enable support of preferences so you can have a set of overlays for VFR as well as IFR. You will also be able to set several options then refresh. There will also be an option to save a custom waypoint and simultaneously add it to the route. A above is a bit more problematic in that these maps are actually created dynamically so they can't reside on the server all sliced up nicely to do the tiled load you are familiar with in Google. Stay tuned I know they are working actively to make some really nice enhancements to AIFP. And as Chris said, use the feedback feature as they do use it to set priorities. Every pilot needs the best tools he can get his hands on. Looks like you got yours in order. Your post is rocking... I really appreciate the way you write . I would like to read more from you on your upcoming videos.. It is very interesting indeed.Thank you for your information. I love to read all information of you band.This article gives the light in which we can observe the reality. The blog was absolutely unbelievable! Plenty of great data and inspiration, both of which all of us need!